Do you ever wish that scientists could just explain what they do in simple words? Or at least, explain a little of what they do? Or maybe even just talk about their studies without using big words in a way that makes everyone else feel foolish for not knowing the words? What about if they sang? No kidding. There are actually songs to be found that were written by scientists, and that were written about science. Some of the songs use familiar tunes, or tunes from classical music. You can find recordings of many of these songs on the Internet. And yes, most of these songs have been written by someone with a sense of humour, and a sense of wonder. For chemists, there's a classic song written by comedian Tom Lehrer which names all the elements of the periodic table. All of them, in a list of names that isn't alphabetical and only parts of it are sorted. He sings the names of the elements to a tune by the composers Gilbert and Sullivan, called "The Modern Major-General." Lehrer's song has been sung on television shows about science, like "The Big Bang Theory" and older shows such as "Gilmore Girls." It's hard to imagine how anyone can ever remember all the names of the elements like this. Singing this song is a fun feat of science memory. Daniel Radcliffe, who played Harry Potter in the films based on J.K. Rowling's books, has been known to sing this song at parties. This kind of singing even works for particle physics. How about a discussion of string theory that's set to the tune of a famous song? It's neat to think that an explanation for how the building blocks of the universe work can not only make sense, but it can rhyme! This particular song is called "Bohemian Gravity" as it is a parody of the song "Bohemian Rhapsody" by the rock band Queen. The video for this song was made up of 70 hours of recordings by a physics student while he was studying for his Master's degree. He uses the name Acapella Science when posting his videos on YouTube for others to enjoy. As one fan wrote in the comments section on the video's webpage, "I'm sure Brian May, the guitarist of Queen with a PhD an Astrophysics, would﻿ approve of this video if he sees it." The Monty Python comedy troupe have covered astronomy in their song about the expanding universe. For philosophy, there's a drinking song written by the Pythons which names most of the philosophers studied at University -- but describes the philosophers as drinking a lot of booze. That's one song for young scientists to hear or sing only with their parents' advice. Listening to science songs might be a fun thing for a family to do together. And singing them certainly can be fun! First Frost... and a Book Giveaway! Hi. 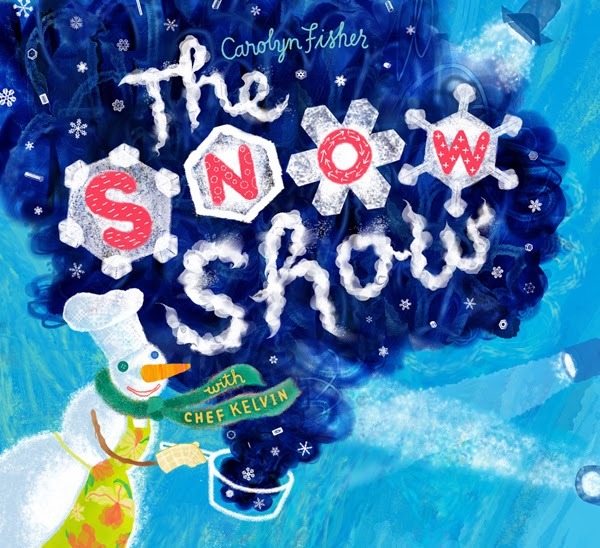 I'm artist and author Carolyn Fisher. I write and illustrate picture books. Today I'm pinch-hitting on Sci/Why for Joan Marie Galat, who is gallivanting around Australia to look at stars in the southern hemisphere. When you're making a book, you do oodles of research. You brainstorm, you write, and then - if you're an illustrator like me - you draw zillions of sketches to plan out the pages. But because my editor gave me a 48-page limit on The Snow Show, there were lots of things that I left out. 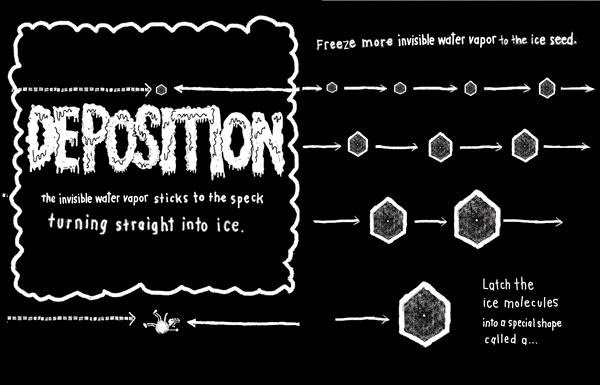 Like how frost is made, for example. 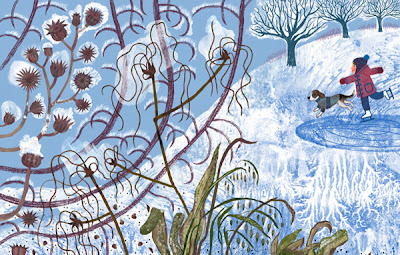 So today, in honour of September's dropping temperatures, I wanted to write about frost. Did you catch that? 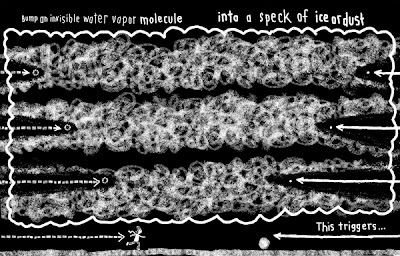 If the air temperature is below zero degrees Celsius (32 degrees Fahrenheit), water vapour molecules can change to ice without turning to liquid first. That’s called DEPOSITION. Snow crystals form when floating water vapour molecules change by deposition directly into ice crystals. 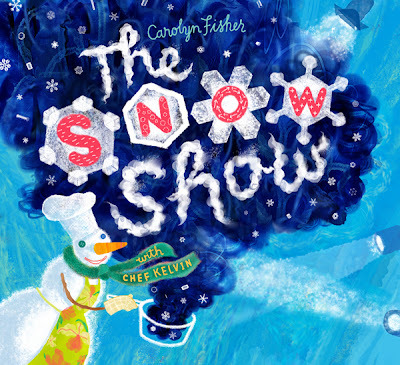 BOOK GIVEAWAY: Is it frosty where you are? What’s the average first fall frost date where you live? Post your answer in the comments by 12 noon on September 30th and I’ll draw a name for a free signed copy of The Snow Show. And if you’re Joan Marie Galat? Don’t bother entering the first fall frost date in Australia. We all know that it’s spring down there! There’s lots of great science happening in the Great White North. (Actually, it’s not very white today – gorgeous fall colours instead – but you know what I mean.) And a lot of that science is being done by Northerners themselves. So I decided to spread the word. Here’s the LINKS bit: I’ve dug out a few kid/teacher/librarian-friendly links for you. You’ll find them below, with short notes about where they lead. And here’s the CHALLENGE bit: Hey, all you Northerners, scientists, science freaks (that’s me! ), geeks (young and old), and wizards of Google-fu - let’s find some more! If you have a favourite science link to something that’s taking place in northern Canada, post it in the Comments section at the bottom. We can build something here. So, here’s my first kick at the can - a mostly-but-not-entirely Yukon contribution. Would you like to learn about the amazing animals that roamed the Yukon 20,000 years ago, when most of Canada was buried under kilometres of ice? Check out the Yukon Beringia Interpretive Centre's Education Corner. There's everything from educational materials for senior grades to colouring sheets for the little kids. And check back regularly. 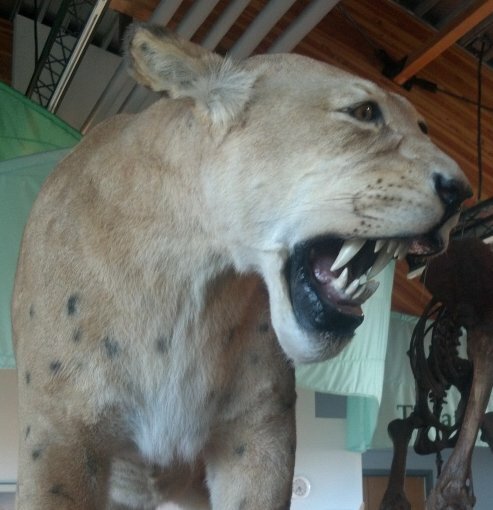 I was talking to the Beringia Centre folk yesterday, and they're planning some great new additions to the site. If I've got you hooked on mammoths, giant sloths, and scimitar cats, there's more information about the latest research (and lots of cool photos) in the online (pdf) booklets Ice Age Klondike and Ice Age Old Crow, published by the Yukon Government. By the way, if you want to know what life is like today at Old Crow, the Yukon's most northerly community and home of the Vuntut Gwitchin First Nation, check out the community website. 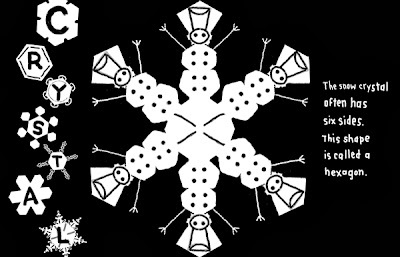 It offers a sampler of the Gwich'in language, traditional stories, culture, history, cooking (lots of caribou recipes! ), and a whole lot of other entertaining bits and pieces of information, including a collection of videos made by Old Crow students. Back to ice ages and climate: how about climate change? The climate is warming faster in the North than anywhere else in Canada. What do northerners think about that? In 2000, the Inuvialuit people of Banks Island talked about their lives and how climate change is affecting them in a video called Inuit Observations of Climate Change, which is online in both a short version and a long version. All that warming has turned up a few surprises. High in the mountains of the Yukon and the Northwest Territories, there are patches of permanent ice, too small to be glaciers but too big to melt over the short summer. Until recently. Now many of them are melting and revealing a record of plant, animal, and human life going back thousands of years. I blogged about the ice patch discoveries here last year. The online (pdf) booklet The Frozen Past has both information and photos of Yukon finds. And Archaeology magazine has an online article about ice patch finds in other parts of the world. For first-hand accounts at what it's like to live and do research at the northwest edge of Canada, check out this series of podcasts produced by the Wildlife Management Advisory Council (North Slope). You'll find everything from elder Danny C. Gordon's account of a lifetime of travel across the Yukon North Slope and park ranger Richard Gordon's song in praise of Herschel Island to permafrost researcher Chris Burn's musings on using both scientific and traditional knowledge to understand the land and its future. Okay, that's my contribution - for now. I won't promise not to come back and add more links in the Comments section, but I'll let you guys have a chance first. What's your favourite science link for the North? And don't think just about the northern territories. Besides the Yukon, the Northwest Territories, and Nunavut, there's Labrador, Nunavik, and the northern regions of most of the provinces. Have I left anyone out? If so, add it in below. As the owner of two cats, I like to think I know a lot about them. I know what they like to eat, where they hide their toys, and how much trouble they can get into without really trying. When I began writing "That Cat!" 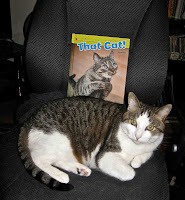 for my new "Word Families" series (Amicus Publishing, 2013), I found out how much I still had to learn about cats. Writing a nonfiction book for children begins with research, so I pulled as many books as I could find from our library. I've included some of these books at the end of this post. Cats have 244 bones; people only have 206 bones. Cats have 32 muscles in each ear; people have only six muscles in each ear. Cats walk on their toes: their heel bone is half-way up their leg. Cats have scent glands on their paws, their foreheads, under their chins, and where their tails meet their backs. That's why they like scratching and rubbing -- and being rubbed, so they can transfer some scent onto you! The sense of smell is very important to a cat. Cats even have an extra organ for smelling located inside their mouths, called the vomeronasal organ or Jacob's organ. Cat tongues are rough because they have tiny, backward-facing spines made of keratin, called papillae. An average cat, like our friendly Sabriel pictured here, has 24 whiskers or vibrissae on each side of his nose, as well as whiskers on his chin, above his eyes, and on the back of each foreleg. 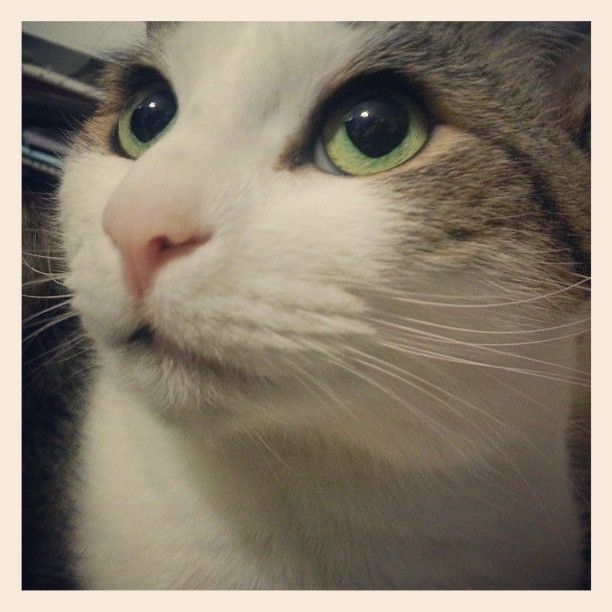 Cats use their whiskers as part of their sense of touch. Their whiskers help them sense the direction of wind and air currents, measure distances, and navigate. As well, whiskers help show their mood. For example, the whiskers would move forward and down when relaxed, forward when aggressive, or flat when defensive. 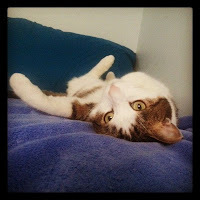 Henri 2: Paw de Deux and other Henri videos; Stalking Cat; Two Talking Cats; and so many more! What habits and behaviours does your cat have that fascinate you? Please leave a comment -- or share a cat video!